October 27, 2017, 10:21 AM · As an object, the violin is one of mankind's great accomplishments. 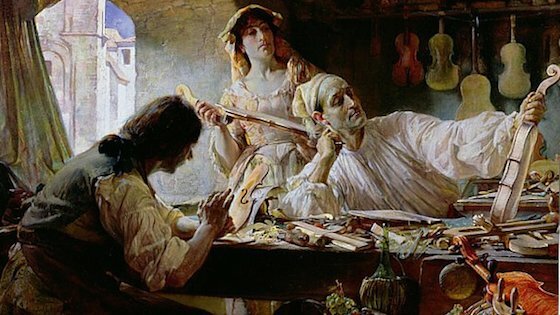 Despite radical changes in society and technology, the design of the violin has changed very little since it was standardized by Andrea Amati in the 16th century and then perfected by Antonio Stradivari a century later. That means that in any given orchestra, musicians are holding violins whose year of origin can range across centuries. Mind-boggling! One violinist might play on an Italian fiddle made in the 1700s; another on a 19th c. French violin, another on an American violin made just last year. The three violins in my possession range greatly as well, with one made in the 19th, one in the 20th, and one in the 21st century! For this vote, select the century when your most-frequently-played violin, viola or cello was made. Then tell us about it in the comments section, and you can also tell us the dates of any other instruments you have. October 27, 2017 at 05:58 PM · My J,B, Vuillaume was made in 1857 and it's the best sounding violin in my possession. I have a beautiful to look at French violin made c.1760 and a modern one made in 2003. October 27, 2017 at 06:14 PM · My Baroque violin is by an unknown Bohemian maker and dates from the mid-eighteenth century. My modern violin was made by Ken Beckmann in 2007. October 27, 2017 at 07:17 PM · I have a Bohemian 1805 Violin, and a French 1857. October 27, 2017 at 07:50 PM · My most frequently played (and most well made) violin is 3 years old. I've got her pretty well played in and opened up now and she blends beautifully with orchestral playing. My violin is a she because my local Luthier (Nelle Doak O'Neil) names instruments after whomever commissions it. Mrs. O'Neil keeps the violin tuned up and in tip top condition, which can be a challenge with my enthusiastic playing style. My second violin was made late last year and purchased online through Fiddlershop.com. It's a terrific backup instrument and has more unfettered projection than my primary instrument. It's not fully broken in yet. My #3 violin (and emergency backup) was bought new and made by the Roth factory in 1970. It projects well, but has a wolf tone. My mom bought it as an upgrade when I was in college. Neither of us really knew how to test violins. But it was an improvement over the 100 year old violin handed down from family. It probably cost $10 and was ordered via catalog in the early 1900s. October 27, 2017 at 08:18 PM · 19th century: 1800-1899. Hand made in Germany, 1869 -- my third 4/4-size instrument. I've had it since near the end of my student days. With the right string combo, which is for other discussions, it gives me the most pronounced viola sound in the low notes. The two others I play were hand made in Germany, 1883; and France, 1921. Not sure which of the three is most frequently played, since I divide daily practice time about equally among them these days. But I named the 1869 fiddle first, since I've had it the longest, and so have played the most hours on it. October 27, 2017 at 08:24 PM · Based on family stories what I call: "The Mittenwald Strad" was made in a German workshop in the mid to late 1800's complete with a lot of inlay work (a.k.a. : Intarsia). It came to the USA with my Wife's Great-Grandfather who played it at church, dances, and other family functions. After he died it wound up in the attic and was brought down when I, the new son-in-law, was getting stuff out of the attic for mother-in-law. I had it restored, adjusted, and replaced most of the fittings (pegs, fingerboard, tailpiece and bridge) which were very damaged. It's been taken apart, the thicknesses adjusted and tuned, reassembled and is still playing. No it is not a soloist instrument but plays well for me. Hindsight says I should have spent the money on the purchase of a better instrument with an actual provenance but, like "Joe's Violin" it has a nice sound and a good backstory. Someday I'll donate it to a student that cannot afford an instrument along with the story of its life. FWIW: Call me anthropomorphic, but he sings hymns very well. October 27, 2017 at 08:50 PM · I'm playing a Bohemian violin made in Prague by Karl Hellmer in 1795, I originally learned on and still have a violin labeled as made by Georg Krauch in Vienna in 1826. Then I have a late 20th century violin of unknown make, prob Chinese, for a travel fiddle. from several of my friends in the luthier world-- and now it SOUNDS. My modern violin is an Jay Haide L'Ancienne, European tone wood, Guad copy. It's a hoot. I set it up myself, and it's a great little fiddle that can fill a room, for sure! October 27, 2017 at 11:29 PM · I play a 1939 American made violin by W.J. Smith (his #56). My research on this maker suggests he was from a Glasgow family, moved to Nova Scotia, and then to New York, but never became a US citizen. He made about 100 violins. It’s a Strad copy with a nice tone that sounds particularly good with Obligato strings. If anyone else out there has a violin by the same maker, I’d be very interested to compare notes. October 28, 2017 at 12:12 AM · I've possessed violins made both recently and in the early to mid 1900s. October 28, 2017 at 12:23 AM · I had a 20th century Tertis size viola. Other instruments I have/had are either 19th or 18th century, depending on what the luthier who dealt with them said. October 28, 2017 at 02:08 AM · I play a 1986 Joseph Kun. October 28, 2017 at 02:24 AM · 1736 Guarneri del Gesu'. It is a wonderful violin. More color than anyone could ever ask for. Thank you. October 28, 2017 at 11:36 AM · 1. 1896 Eugenio Degani, Venice. October 28, 2017 at 03:45 PM · I have a 1921 Romeo Antonniazi made in Cremona, Italy. My parents bought it from my violin teacher when I was in high school and I have played it for 57 years now, so really know nothing else. October 28, 2017 at 03:46 PM · I have a 1921 Romeo Antonniazi made in Cremona, Italy. My parents bought it from my violin teacher when I was in high school and I have played it for 57 years now, so really know nothing else. October 28, 2017 at 04:08 PM · I have a violin and a viola by John Marshall of Aberdeen, early 20th century. Both sound good. Here is a link to pictures of them. The Marshall violin on the left belongs to the photographer. October 29, 2017 at 09:45 AM · I have one violin which I have had since I was 16 years old. I am now 90. It is an English violin made by John Walker of Solihull Birmingham in 1924.lovely tone and projects well. I have had many other violins pass through my hands but none surpassed the Walker. October 29, 2017 at 12:38 PM · I have more fiddles than sense. 1. Possibly a Jeffrey Gilbert, made in late 19th or early 20cy in England, but violin expert friends disagree on it’s provenance. It is very powerful and takes some controlling, but I think it sounds great. 2. A ‘Medio Fino’ from the JTL violin factory in France, given to me by my Aunt after her choirmaster husband died, it has a lovely sweet tone and is so easy to play, but ink purfling and a very plain one piece back. 3/4. 2 German factory violins, both of which sound fine, one is bassy and viola sounding and the other has more treble, both are loud enough for solo playing. 5. Stainer Conservatory Model, which was an impulse buy and is lacking in the volume department. 6. Yitamusic Chinese violin which, with the addition of a Fishman V200 transducer, I use to play in my Ceilidh Band. It’s lacking somewhat in acoustic volume, although it has a pleasant tone, this lack of sensitivity is just what is required for an electric fiddle, it doesn’t feed back through the amplification. October 29, 2017 at 01:32 PM · I play a violin that I commissioned from the Danish maker Jens Stenz in 1995 after having tried one of his violins that a friend had bought. It is a guarnerius model with a beautyful one piece back that Jens had acquired from the estate after a luthier i Berlin. The wood had been stored for more than 100 years. I was a student at the time and spend practically all my savings on that violin. Never regretted it. My viola is a new instrument by William Castle built in 2014. October 29, 2017 at 03:45 PM · I’ve been very blessed. 4/5 of my violins vere given to me over the past 10 years. October 29, 2017 at 06:11 PM · My Jay Haide was made in 2002, according to the label. My other violin has been passed down through my family since 1850. It was apparently bought from a professional Irish violinist in West Wales by one of my ancestors. There is a suggestion that the Irishman was fleeing the Famine and badly needed the money; if true, that is indeed a sad story, but the instrument has been in good hands ever since. Local luthiers in my area have identified the violin as of the mid-late 18th century. They didn't believe the original-looking label (which I'm not going to identify!) but thought the violin was most probably a good German copy. October 29, 2017 at 08:13 PM · Mine dates to the early 1800s. My luthier kept it in spite of its rather deplorable state because he was intrigued by the mix of Italian and cisalpine features; the dark varnish points to an Austrian or Hungarian origin, but because the f-holes have been messed with it is difficult to ascribe the instrument to a specific maker. In spite of its battered look I fell in love with its lovely tone which came forth immediately - and that was really surprising since the instrument had not yet been set up when I tried it out, and it hadn't been played for decades. My other violin is early 20th century, probably manufactured in Southern Germany and between 7/8 and 4/4 size. More accommodating to play for my problematic left hand, but narrower in tone than the Dark Lady. October 29, 2017 at 11:48 PM · I am like 172.222.202.115. My #1 violin was made in Germany in the 1920s. My father bought it from my violin teacher when I was about 12 years old. I have played it for about 57 years and I have always loved it. I have two backup violins which were made at about the same time, one in Germany and one in France. October 30, 2017 at 03:48 AM · H. Roth...1967..
October 30, 2017 at 07:29 AM · Mine might be one of the youngest on this blog - it was finished in April this year. A beautiful Lord Wilton del Gesu copy by Colin Adamson of Edinburgh. The neck and scroll is made from a block of maple I have owned for 43 years. It finally achieved its intended potential and makes the violin really my own! Love it!!!! October 31, 2017 at 03:01 AM · My main violin was made in 2001 by a Berkeley, CA maker. I bought it from him in 2003 and it has been getting better and better over the years. My 2nd violin is a 19th-century anonymous instrument, possibly English, that I found languishing in Nova Scotia and had restored to playing condition. Just a beater violin but easy to play with a reasonably good tone; perfect for fiddle camps. October 31, 2017 at 01:06 PM · I also have an unlabelled French violin dating from about 1820 but up till getting my Adamson, I played an 1883 George Duncan of Glasgow. It also bears a label stating it is a facsimile of the Alard Strad, owned by David Laurie, the 19th century Glasgow collector and dealer. I’m pretty sure that label is in Laurie’s own hand, but can’t get a handwriting expert to even look at it! I also have a Ruddiman of Aberdeen made the same year Beethoven was born - 1770! November 1, 2017 at 07:08 AM · My main is c.1750. I've had it appraised by someone who has a theory that it was bought by a Paris maker and dealer to pass off (unusual I think to have an instrument better than its label). The appraiser can't prove his proposed attribution but if he ever gets a chance to examine an instrument by that maker he's promised to get in touch and compare it directly. It has a large crack in the top and a repair label Arthur E Smith 1917. Smith being a good Australian maker. It's had more work done since my family first got it. It has a huge sound given a chance and is lovely to play, but can't stand up to professional level playing which is how come I have it now. Next instrument (daughter plays it) is CA Vatiliotis 2015 - he's a Sydney maker who trained under Smith. My son will hopefully have a Vatiliotis 2017 currently under construction! I also have a Vatiliotis viola 2014 which I need to play more. My teaching instrument was my mother's school violin. As I understand it when she went to grammar school they gave her a violin that she said "I'm not playing that", at which point they looked more carefully at the school instruments and let her have this one. It has a Vuillaime label and probably IS French. It has a good carrying tone. 2) A German--or possibly American--violin from the early 20th Century. It has a nearly illegible handwritten label with a date of 1923 (cannot tell whether it is a maker's or repairer's label, though there are many repaired cracks on the table). I acquired it from a luthier friend in Chicago who told me that it had hung for years above someone's fireplace as an ornament before she rescued and restored it.